New signing Elliott Ward believes he can be the experienced head in MK Dons' toiling defence for the remainder of the season. Ward, who joins until the end of the season from fellow League 1 side Blackburn Rovers, has played in excess of 325 games during his career at centre back. Dons' defence has shipped 40 goals in 28 games this season, seeing them drop to 21st in the table. Ward, now 33, hopes he can bring some stability to the defence, while helping some of the younger players in the process. 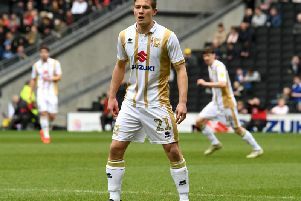 “It’s come to that point of the season where it’s important to play games and hopefully I can do that here and help the team in the process,” Ward said after completing his move to Stadium MK. “It’s a young group here and hopefully I can bring some experience to the team by going out there and doing my job. Ward joins fellow defender Josh Tymon in signing on Tuesday as Dan Micciche looks to bolster his squad ahead of the transfer deadline on Wednesday night. “We needed to add another centre-half after the unfortunate injury to Joe Walsh,” Micciche added. “It was important, for me, to bring some experience in there and Elliott has a fantastic CV. He’s extremely professional, he’s good on the ball and he’s an excellent reader of the game. He’s also got a good stature and presence.